According to the Housing Affordability Study done by Black Hills Knowledge Network, 35% of local households are paying more 30% of their income toward their mortgage. 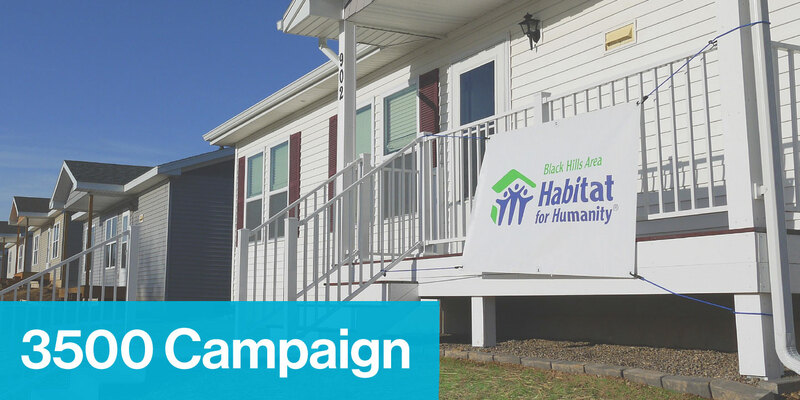 The goal of the 3500 campaign is to build awareness of the need for affordable homeownership in the Rapid City area. Spread the word about the campaign prior to the event, and encourage others to bring a house. Assemble your house and bring it to ReStore located at 610 E. Omaha St.
Post a picture of yourself (and maybe some friends!) on Facebook or Instagram holding your tiny home or dropping it off with #3500homes. Give involved to ensure affordable housing is available for all. Click here to download your house! Smart policies and systems can promote access to decent housing, while other policies and systems may create unnecessary barriers. These barriers may make it harder than it needs to be to find land for construction, build the home itself or be able to afford a place to live. To address that level of need, we invite you to advocate with us for housing policies and systems that address the global need for housing.